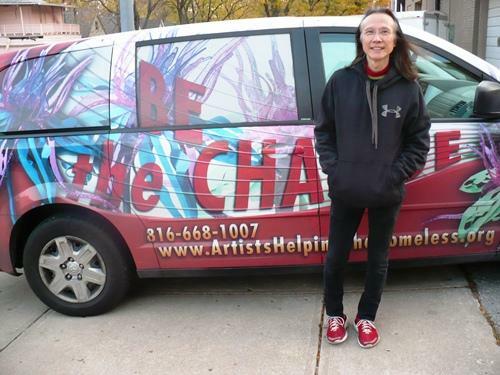 Until 1 a.m. every day, Kar Woo, a slender man with dark shoulder length hair that’s greying around his ears, drives around this brightly painted mini-van, with the Gandhi quote, “Be the Change,” printed in big red letters on the side. He drives it between hospitals, domestic violence shelters, schools, bridges, treatment centers, and even jails, helping people who are homeless. More than 10,000 people are now homeless in the Kansas City area. Finding a way to get around to appointments or to shelters can mean the difference between breaking the cycle of homelessness and winding back up on the streets, in crisis. The challenge has added strain to area emergency rooms and the community at large. “They’re surprised at what we do. They say, ‘You’re just going to take us to a safe place and not charge us, no questions asked?’” says Woo. Woo slows down next to a guy walking with a crutch on 47th street. The man asks for a ride. “Sure. Get in,” responds Woo. Woo has driven around so much, he burned out his first van. He has two vans now, and two staff members. He takes calls directly from people, and from hospitals, shelters, even libraries. But Woo emphasizes his group is not a cab service. Instead, during that maybe 20 minute ride, Woo gets to know people. And he follows up with them, sometimes for months - taking them to appointments, checking in on them, and connecting them with services. Woo didn’t plan to do this kind of work. Woo grew up in Hong Kong. He came to the states for school, with barely any money and barely speaking the language. He spent close to thirty years working in retail, selling art and making it. It was only when he moved his art store five years ago to a spot on the Plaza, next to Mill Creek park, that Woo started connecting with people who were homeless. “I walk my dog every day…and I have a dalmation, so we are very friendly looking,” says Woo. People would approach him. He also served food in the park with volunteers every Sunday. Soon, Woo’s art shop was looking more like a drop-in center for people. Meanwhile, across the street St. Luke’s, like many other hospitals across the country, was trying to figure out what to do about homeless people that were coming to the ER not because of a heart attack or other health emergency but for things like food and shelter. Hospital staff said it wasn’t a good use of emergency room resources, and it wasn’t addressing people’s ongoing problems. When St. Luke’s learned about Woo, they approached him, in the park, about setting up a wide, transportation program. Woo closed the art business, and since he started giving rides two years ago, he’s nearly cut in half the number of homeless visits to St. Luke’s ER. Woo says he doesn’t think about why a person’s in the crisis they’re in, instead focusing on what’s best for them in that moment. He also doesn’t ask anyone to change. “When was the last time you or I changed?” asks Woo. “Our approach is we don’t judge, don’t do anything. When you’re ready, you call us and we’ll be there for you,” says Woo. Jim Ault is a biker with a curly pony tail and a meth addiction. Ault says he’s been homeless off and on for 20 years. Ault’s time for change happened this past summer when he called Woo. “A friend of mine told me about him, said it would be good to talk to him and he’d understand me more than anyone else,” says Ault. “When we met him, we literally pulled him off the creek, at Brush Creek. He was soaking wet, and he was having an episode of issues. He didn’t trust anyone. For some reason he called me,” says Woo. Woo helped Ault find some stable housing. He now volunteers with Woo, serving food to people the park on Sundays and helping with repairs on a building Woo plans to turn into an emergency intervention center next year. By the time it hits one in the morning, Woo has made a lot more stops throughout the metro, but he says the long days don’t bother him. “If you’re passionate about something, you will give 120% effort,” says Woo. Woo says he’s looking forward to the next day, and the next, when he’ll get to follow up with more people whenever they call – whether that be day or night. Funding for health care coverage on KCUR has been provided by the Health Care Foundation of Greater Kansas City.